Once there was a cute, fuzzy, lil', yeller capalillar, who realized he was very bored. So, he decided to go out and play. First, he decided to do chin-up exercises so he wouldn't stretch a muscle while at play. A one... and a two... and a one... and a two. All those chin-ups make for a hungry fuzzy, lil', yeller capalillar. So, he decided to have a little snack. Not to be called "lazy", he decided to continue his stretching exercises while snacking. But, the fuzzy, lil', yeller capalillar was lonely. A day at play is ALWAYS better when shared with a friend. "Hey Buddy! Wanna play Follow the Leader?" Nuthin makes for a better day than spending it with a friend. Misty this is the cutest post! Great photos and I loved the play by play! Misty!!!! I love this! The pictures are fantastic. So cute! Love the story. Mist - what a wonderful series of shots. You have captured a caterpillar with personality. Misty: Very cool, You followed the movements for a while, nicely done. Read the bottom of mine. These are so good! See all that hair in that caterpillar? That is going to itch for sure! My critter is posted HERE. Please stop by if you have some time. Happy weekends! 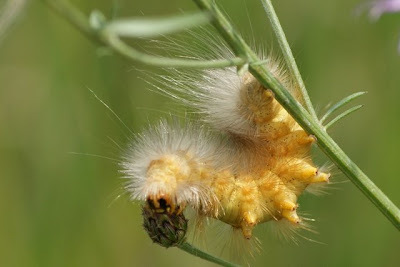 Never thought about a caterpillar as being cute, but darn! this one is. Look at that flexible, furry little guy! I love these photos! Very awesome find. He's so cute. So neat and amusing... I love the last photo where a beetle has joined the caterpillar. Lovely! Great photos and what a cute commentary. Always a pleasure to visit you. p.s. thanks for sharing about depression--I left a message & hug. Delightful critter. He so fuzzy and cute. Great shots and words again. You outdid yourself on this one. They are extremely sharp with vivid colors and you have a good story to accompany the photos. 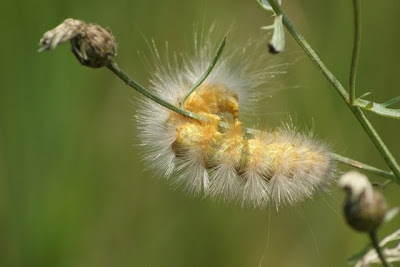 Your fuzzy caterpillar is an interesting character. I enjoyed the story. Golden Caterpillar in action! Could you observe it to see the beautiful butterfly it would turn in to. Very nice shots of the caterpillar. I love the commentary as well. I just finished reading some of your other posts and I completely understand the organization problem with the photos. I hate to delete any images. Definitely an OCD thing. I need to either buy a DVD burner or an external hard drive one before I run out of room on my laptop. Oh and the depression thing, I don't think you could have done a better job explaining it than that. I know I am battling mild depression and I think some of it is post-partum. Lovely shots. Is the bug explaining about Life, The Universe and Everything, do you suppose. This is such a lovely series of photos, and the commentary is perfect. All so creative. Misty, these are great selection of photos. I know just what you mean about Depression, Ive experienced it in the family. 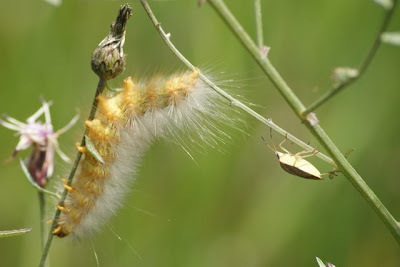 What a neat peek into the real world of caterpillars and that other bitty critter! Looks like he's doing some stunts for you. That last line is class, and so true. What fantastic shots these are, and I love the story you tell with them. Misty, your words and pictures are always so beautiful Some day you really must tell me what camera you use! Love the pictures and your story to go along with them! Congrats on being one of David's post of the Day - twice over!!! Awwww... what a great series of photos and I love the story that goes with them. The lil' yeller capalillar is actually kind of cute (in a fuzzy sort of way). I love this post! Really nice shots of that caterpillar! Now, I want to take a Walk-About with the camera and go bug-hunting.